On a winter's morning, I set off from the Church hall at Crook near Kendal. My destination was Bowness on the east side of Windemere, my route taking in the "Dales Way" and then heading back towards Crook over the top of Brant Fell, then heading south East to return. 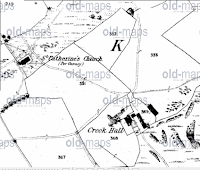 We skirted around Knipe Tarn and visited Birk Moss on the way. This path took us in a North Easterly direction to St Catherine's church tower. I had seen the mark on the map but I was surprised to see an almost intact church tower and no church. However I photographed the tower, inside and out. The inscription was informative. I repeat it here although the Internet is awash with pix of the tower and the inscription. 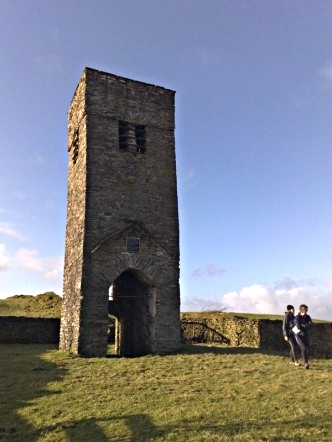 This tower built about 1620, is all that remains of the old Church which served the parish from 1516 until 1887 when because of structural defects, the body of the church had to be demolished. The tower was allowed to remain as a local historical landmark. 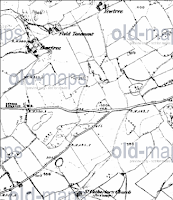 It was restored in 1993 with the help of grants from English heritage and the Lake District Special Planning Booard and a generous donation in memory of Judy Logan of Birk Moss, Crook 1963 - 1989." 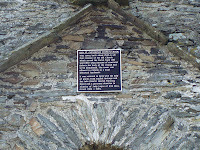 Whilst photographing the tower I spotted a gravestone Having read the inscription (below) and realised that as the church could no longer be on consecrated ground, there must be a reason that the the stone must still be there. 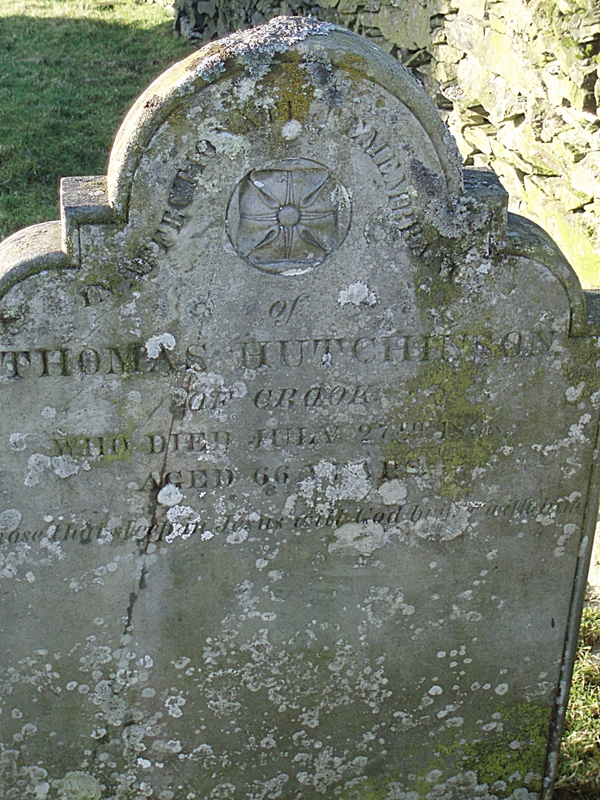 The name Thomas Hutchinson is clearly recognisable, the date of death is too. 27th of July. However little else is clear. 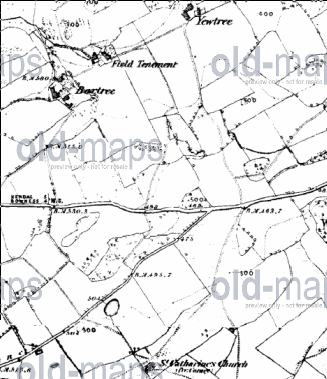 Ancestry revealed a Thomas Hutchinson an Agricultural labourer, at a Yew Tree Farm or Cottage married to an Isabella Hutchinson in the 1861 census. Ancestry tells me that Thomas died in 1868, aged 66. 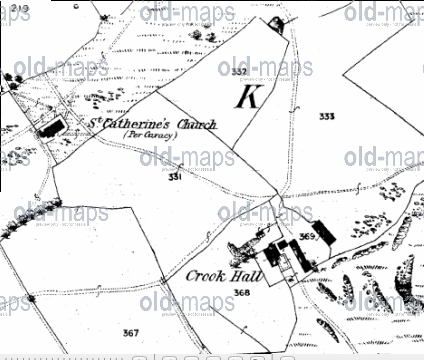 Old maps website reveals that Yew Tree farm was opposite the church. He must have been regarded as special to be "allowed" to watch over his land. One or two mysteries remain. How could an "Ag Lab" be able to afford a quite superior gravestone. However census details are frequently wrong. 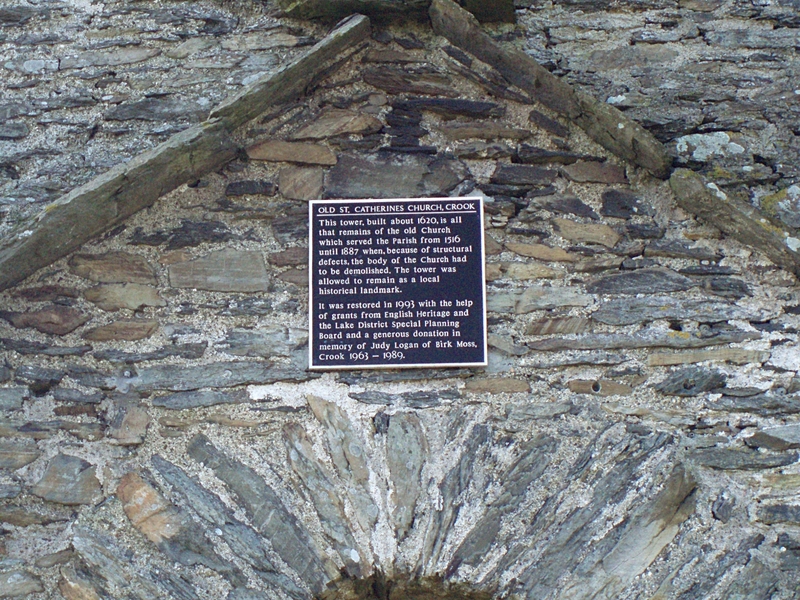 The stone may well have been commissioned by the church if he had served the church with particular dedication. So it appeared that Crook has had at least three churches, a little unusual. 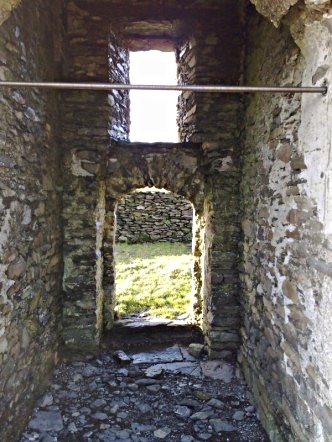 It is also unusual that the original church was away from the village, placed on a low hill, yet still up quite a difficult track. It is said that bell from the old church has been installed in the new church. The Church hall is also a fair trek from the church too! 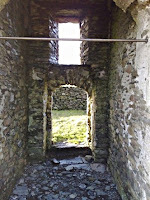 An explanation may be that the old church was the chapel attached to Crook Hall. The last image is the tableau that is in the church hall. 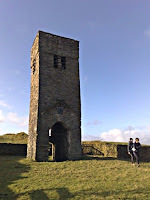 St Catherine's tower is clearly visible at the top of the picture. So interesting! Good day out and followed off by a visit to Lord's Lot! I have been given to understand that the new St Catherine’s church is based on the structure of the old St Catherine’s church so if you want an idea of what the old church looked like - look no further than the new!